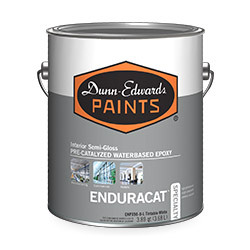 ENDURA-COAT® * is a high performance, interior/exterior, low VOC, direct to metal, water-based acrylic Industrial Maintenance Coating with excellent corrosion resistance and direct-to-metal properties. It can be used on properly prepared and primed metal, wood, masonry, plaster or drywall. 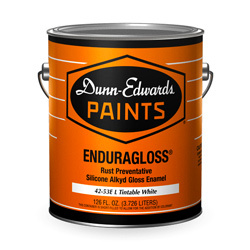 ENDURA-COAT is available in eggshell, semi-gloss and gloss finishes. In comparison tests, we applied ENDURA-COAT and leading competitors on steel. ENDURA-COAT clearly beats the National Brands, as their paints show significant rust and corrosion development. Coatings are applied to a 4 inch by 6 inch dull finish steel panel using a standard drawdown bar to a uniform film thickness of 1.5 to 2.0 mil dry per coat. After drying, a second coat is applied at the same thickness bringing the total film thickness to 3.0 to 4.0 mils dry. After the drying period, all panels were checked for mil thickness and scribed (cut into) with a four inch “X” on the face of the metal panel using a box knife. After scribing the panels, each set was placed into a salt fog chamber where the panels were subjected to a corrosive environment for 504 hours. 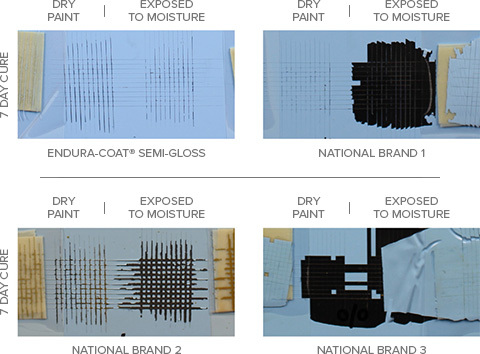 Note: For the topcoat corrosion tests, panels were primed with the recommended metal primer for the competitive samples and with the ENDURAPRIME for the ENDURA-COAT. Good adhesion means the paint sticks to the substrate allowing for better protection of the painted surface. ENDURA-COAT does a better job at sticking to steel, as the competition is more prone to peeling, especially when exposed to moisture. Paint is applied using a 3 mil drawdown to a standardized substrate and allowed to dry for 24 hours at room temperature. After 24 hours, two crosshatch patterns are made, one on the left for dry adhesion and one on the right for wet adhesion. A paper towel is then cut into 1”X1” square and allowed to soak into the film for 10 minutes and then removed and the test area is blotted dry to remove excess water. The film is allowed to dry for 30 minutes. A permacel tape is then cut into approximately 3” long pieces and placed in the center of the cross hatch and smoothed out. The tape is then removed by seizing the free end and pulling it off rapidly back upon itself at an angle as close to 180 degrees as possible. The process is repeated on the dry adhesion crosshatch. After the tape is removed the crosshatches are evaluated and rated. * Stores located within the South Coast Air Quality Management District (SCAQMD) must not recommend or sell this product to anyone other than painting professionals, and only for qualified Industrial Maintenance projects. It is for “Professional Use Only” and “Not for Residential Use” within the South Coast Air Quality Management District (SCAQMD) of California. Outside the SCAQMD, this product can be recommended and sold to all users for all projects. Please contact a Dunn-Edwards representative or your local store for additional information. It is always recommended that ENDURA-COAT® be used over properly prepared and primed surfaces.